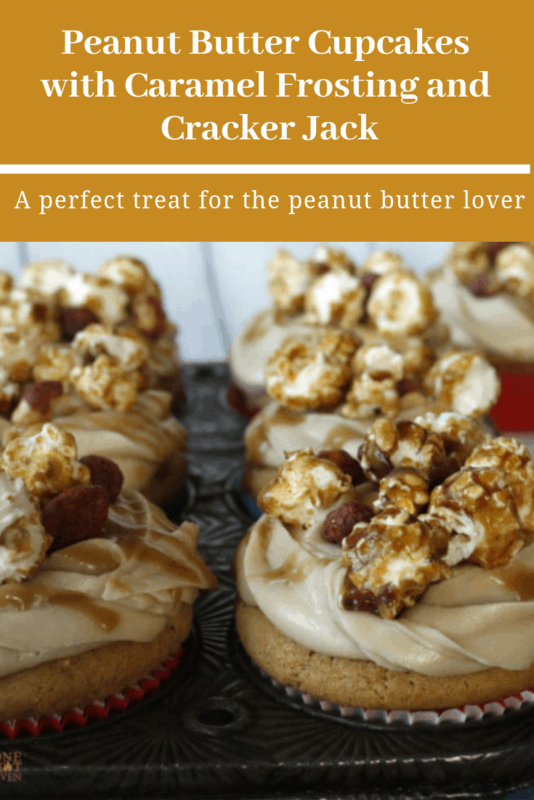 Baseball Spring Training was the inspiration for these Peanut Butter Cupcakes with Cracker Jack. This year we went to see the Cactus League in Arizona to watch our favorite team, the San Francisco Giants. We watched four games and went to three different stadiums and of course ate our favorite stadium food – hot dogs, tacos, nachos, peanuts, and caramel corn. 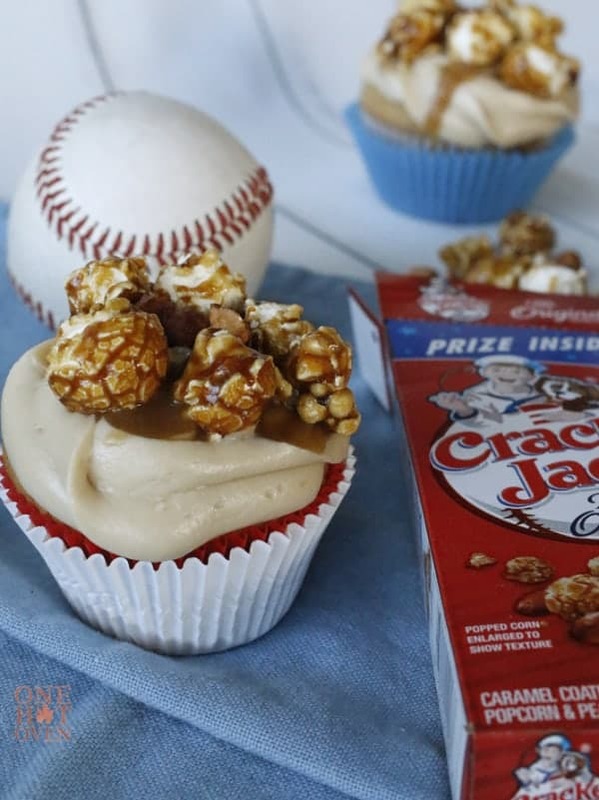 In honor of baseball’s opening day, we are making Peanut Butter Cupcakes with Caramel Icing topped with Cracker Jack. 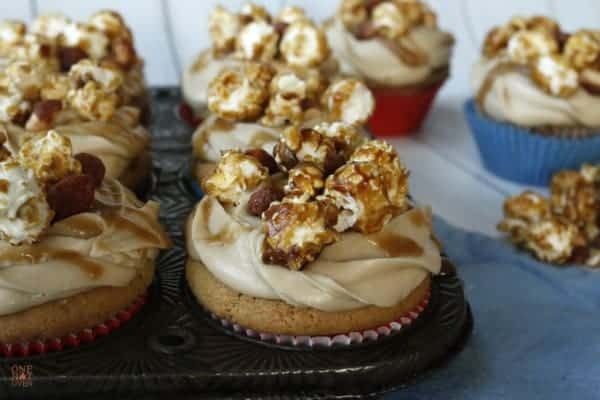 Yes, this cupcake has everything in it and on top that will remind you of a box of cracker jack with peanuts, caramel, and popcorn. These cupcakes are perfect anytime, but for us, we will be making these for the 7th inning stretch when we need a snack during the game. Next time you need a dessert for the Little League banquet or maybe a softball game, look no further than these cupcakes. They look impressive without much effort and they taste even better! A home run dessert, if I say so myself. 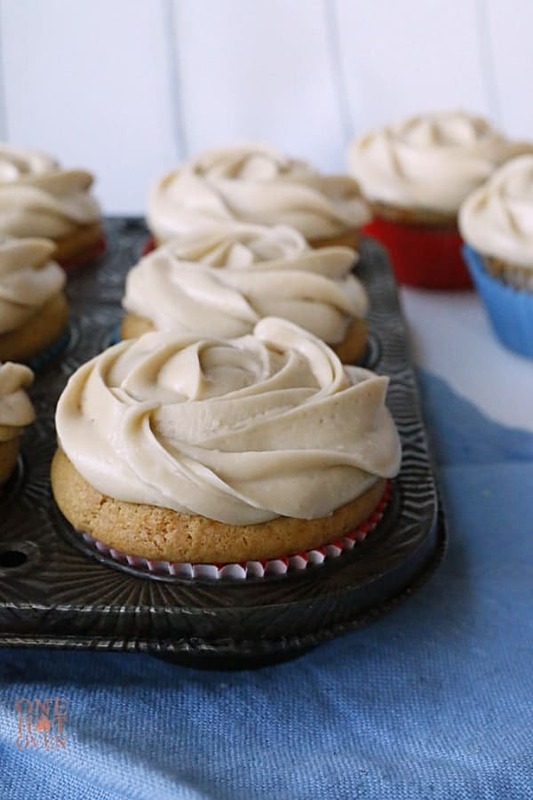 Even if you aren’t a baseball fan these Peanut Butter Cupcakes are perfect on any dessert table. Don’t let this recipe throw you a curveball. They may look complicated but trust me, everything is simple in this recipe. Mix the cupcake batter and scoop into your pan lined with paper liners. Bake for 16-20 minutes until nice and golden brown. Top the cupcakes with frosting, I used the 2D piping tip to make these nice rosettes on top. Drizzle on a little caramel and top with Cracker Jack. That’s how we knock a dessert out of the park! 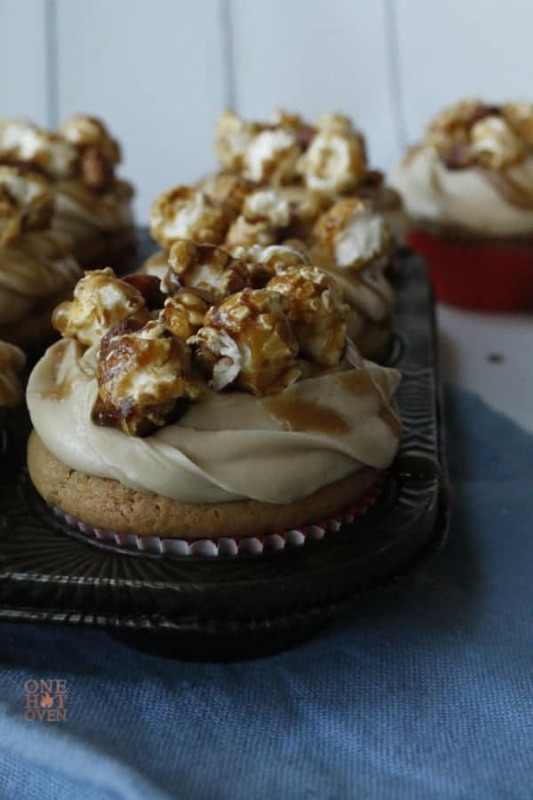 There is some serious flavor in these Peanut Butter Cupcakes topped with Caramel Frosting and Cracker Jack. 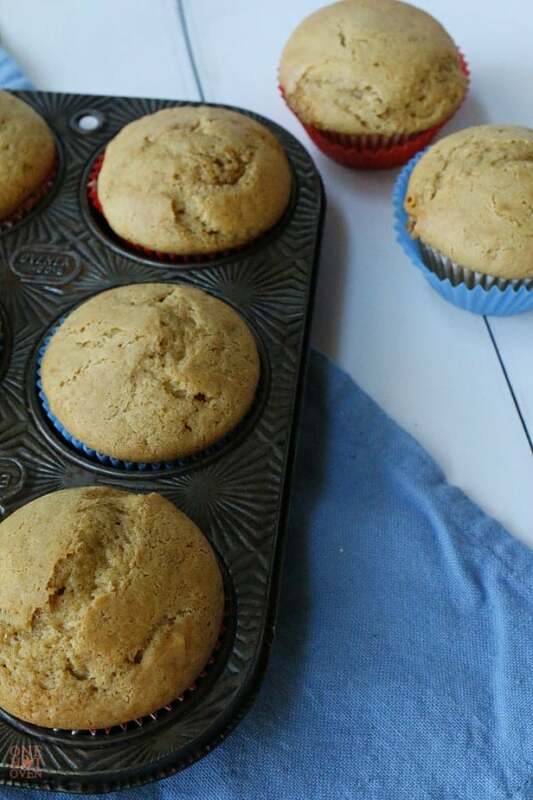 Preheat your oven to 350 degrees and prepare your cupcake pan with liners. In a large mixing bowl beat the butter and brown sugar until light and fluffy. Combine the dry ingredients and then add 1/3 at a time alternating the flour and milk. Beat well and scrape the sides of your bowl. 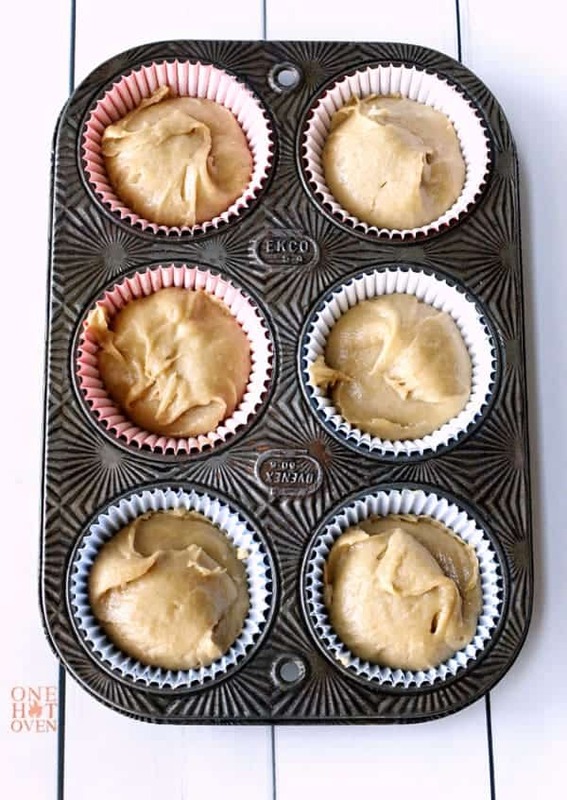 Scoop into the prepared cupcake pans and fill 2/3 full. Bake for 16-20 minutes, until golden brown and an inserted toothpick, comes out clean. In a medium saucepan stir together the brown sugar, butter, and milk. Cook over low heat to dissolve the brown sugar, then increase the heat to medium and cook for 4- 6 minutes without stirring. The mixture should be an amber color with small bubbles around the pan. Set aside 3 tablespoons of the caramel to drizzle on the cupcakes. 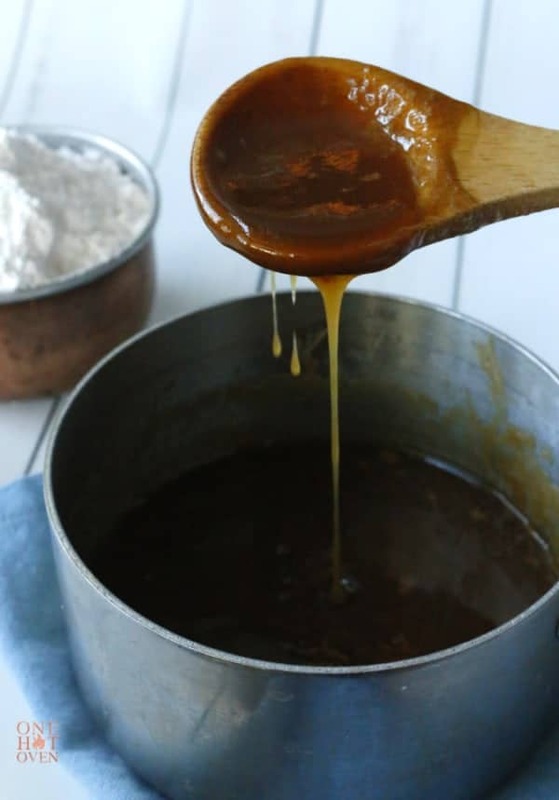 Pour the remaining caramel into a mixing bowl and let cool. The mixture will thicken as it cools. Slowly beat in the powdered sugar until the mixture is thick and creamy. You may have to add some milk if your mixture is too thick. Drizzle on the reserved caramel You may have to heat the caramel a bit if it has thickened. Top each cupcake with Cracker Jack. Store the cupcake in an airtight container for up to three days. It’s the 7th Inning…time for cupcakes! 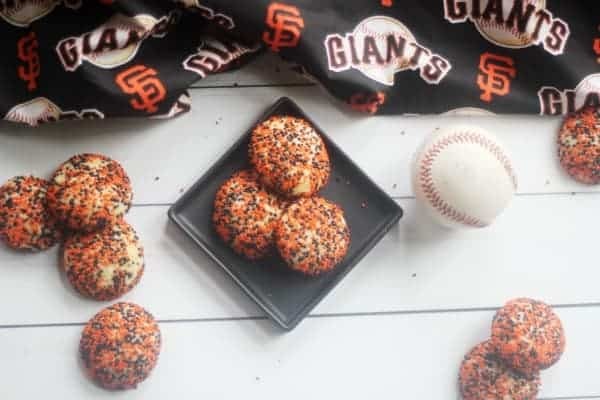 Our previous Opening Day treat were these fun and colorful Orange and Black Surprise Inside Cookies in honor of the Giants. These sweet butter cookies are covered in sprinkles and hide a tasty surprise middle layer. 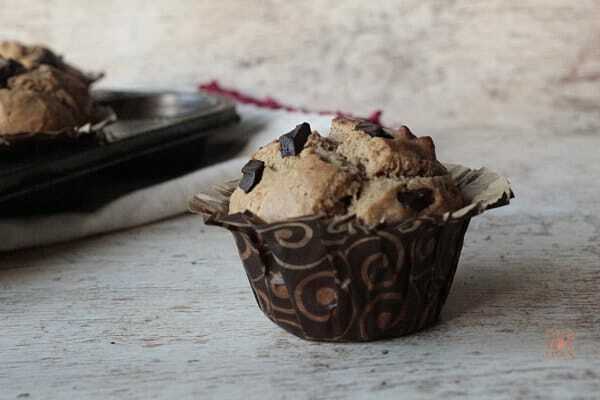 If you love peanut butter try these Peanut Butter Chocolate Chip Muffins that are full of that classic peanut butter chocolate duo. Caramel Corn is one of our favorite snacks and is so easy to make. 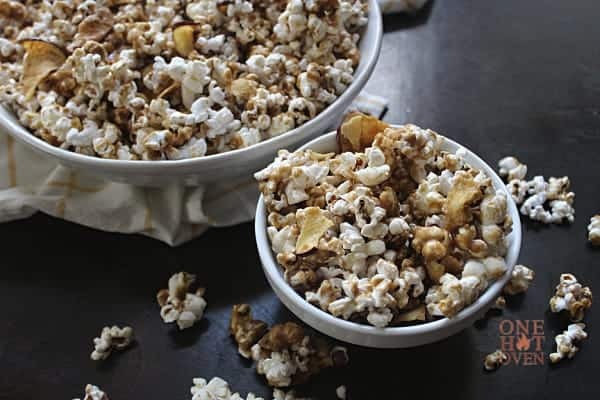 Try this One Hot Oven recipe for Cinnamon Apple Caramel Corn, a perfect snack for game night. Before you go make sure to pin for later when you start craving something peanutty.